The attached materials came to me from the UN refugee office in Damak city, Jhapa district, in the far southeast of Nepal. There is a sound recording of a female refugee and a sample of her writing in which she employs at least two different scripts, Roman letters and another that looks like some syllabaries of South China I've seen. I suspect that she might be from northern Myanmar (esp. Kachin state), from which a flood of refugees is now pouring due to the unrest there. In her written sample, she seems to mention Ang Sui Ki and other names and words that are more or less recognizable. As with the post cards in unknown languages that we've posted on LL to good effect, perhaps we can invite the collective readership of LL to help us solve this one too. I wouldn't assume "ang sui ki" is Aung San Suu Kyi. It looks multilingual to me. Forms like "tbilis" and "savebnah" don't have a typical Lolo-Burmese syllable structure, and it doesn't look like Jinghpo. I might look at Limbu/Kiranti, something like that, but the symbols aren't the Limbu script. Could this be a modified Chu Yin script, adapted to a southern minority language of China? Interesting rate of word repetition. 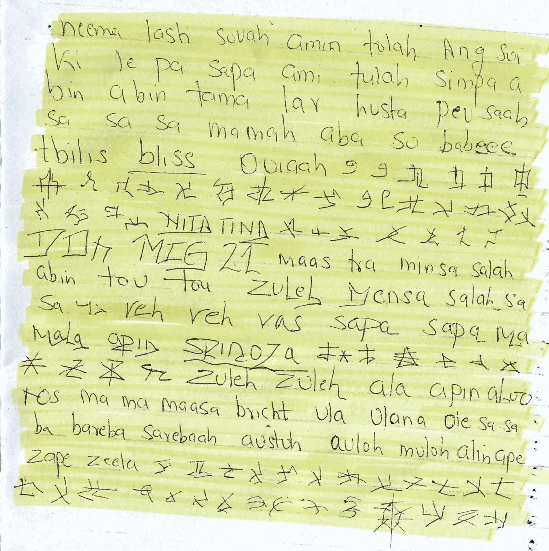 "simpa abin abin", "peuh saah sa sa sa", then the sentence "minsa salah abin tou tou Zuleb Mensa salah sa sa ya reh reh ras sapa sapa ma mala spin spinoza". Also, I tried cutting and pasting a few two word sequences from the text into Google search and all of them came back with twitter posts in Indonesian. Is it possible that "mamah aba so babeee" means "mother father and baby"? This is a job for Omniglot. Possibly something from Northeast India? It sounds like perhaps "India" is said in the recording, and there is quite a lot of political unrest in that area. The recording sounds non-tonal, which would argue against Shan state. The phrase Liberty Lidz mentions, repeated many times and echoed by someone else in the recording, is to my western ears something like /indija idjota/. If it's what I think it is ( "India's an idiot"), perhaps someone isn't pleased with the Indian government, and is possibly not from India, or is from an eastern region which doesn't consider itself particularly tight with the Indian state. Also it would mean the language has SV order, which is pretty universal in that area (per WALS), but doesn't require a copula (variable in the region). It would also mean that the language has borrowed from a European language, likely English. That should narrow it down to about a gazillion languages, no more. I completely missed the recording. Parts of it do resemble Tagalog, and those pharygeal h's sound very un-Tibeto-Burman, so… I give up. I still think the written "version" is a melange of a bunch of languages. And, the UNHCR camps in eastern Nepal have mainly Bhutanese refugees, who are mainly Lhotshampas, speakers of Dzongkha and Nepali, and other Tibeto-Burman Nepalese languages. I hear some breathiness, which may or may not be phonological, suggesting Tibeto-Burman, but as pointed out, the syllable structure doesn't match so much. Perhaps something Tibetic, but phonetically conservative? The writing looks more like Tocharian than anything else I've come across, but obviously, that can't be it. Curiously there's a word that looks like SPINOZA in the sixth last line. Honestly it looks like disordered automatic writing to me. There are parts in the fifth and seventh lines which have similar forms in sequence which don't occur elsewhere in the text (like the glyph that looks like 中), which suggests free association. I don't have any expertise here, but many of the written words look vaguely malayan/indonesian. The closest such language group might be Moglen/Mogen, spoken by the "sea gypsies" in Burma and Thailand, which has taken on words from many other surrounding languages. As for the references to India, they do have a reputation of being very rough to anyone trying to come in from Bangladesh and Myanmar, to the point of shooting people trying to cross the border. Or something to do with the ongoing unrest in India's northeast, in which case it might be some Tibeto-Burman language. I wonder if it isn't some kind of pidgin or creole. There seem to be a lot of repeated words: abin abin, res res, zuleh zuleh. Don't Malay and Indonesian-type languages often make plurals by repeating? I'm no linguist but I've been teaching handwriting to an 11-year-old lately. To me the spacing, the lack of punctuation, and the repetition suggest handwriting practice — Either she was practicing on the page or someone told her "write something here for us" and she wrote whatever words came to mind. So I don't think there will be any grammar clues in there. I doubt there's a single complete sentence, and the non-latin glyphs look more like doodles than real characters to me. In fact if they were copying from a handwriting book there might be non-words in there too, jumbles of letters designed to encourage practice of a particular letterform — notice that there is an "a" in almost every word in the first half. On the other hand the writer has obviously done a lot of handwriting in the latin alphabet because there are consistent styles of lettering on "a" and "s" and others. sa sa sa saah? NITA TINA? ma ma maasa bricht ula ulana ole sa sa ba baneba? I agree with Daniel – the writing at least has got to be "free association". The bulk of the recording is more plausible, but the repetition of variants of "idios(a) india" in the second half of the recording suggests something similar. The phonology sounds oddly like the Philippines to me, but that's just an uninformed impression; it's certainly nothing I recognise. d. reduplication appears to be prevalent. "Neema Lash" may be a woman's name, perhaps indicating Indic influence. There is a reference to "mig 21", which is a fighter jet (Russian / Chinese), perhaps an indication that the speaker is fleeing a war-torn area. "Salah" may be a loan from Arabic ("prayer"). "Simpa" and "tulah" show up in Internet searches as being Malay, so perhaps this language is Austronesian or has contact with an Austronesian language. The English words "bliss" and "Spinoza" are underlined, perhaps indicating that the author is aware these are loanwords. Perhaps there is a Dutch colonial influence indicated by "Spinoza"? In the recording, "India" appears clearly several times; additionally, at one point it sounds like she may be saying "Bihar", which is a province in India close to the location of the refugee camp in SE Nepal. The language does not look Tibeto-Burman (either Indospheric or Sinospheric). There are some Austronesian languages spoken in NE India and Bangladesh in the region, but I think their phonologies would look rather different? The writing system is quite mysterious. Most scripts of India and the Himalayas are devanāgarī-based, but this one is not. This doesn't rule out that this language is from that area, but neither does it support it. Some of the writing looks vaguely similar. I am a Tagalog/Filipino native speaker and linguist, and this certainly is not Tagalog/Filipino. Tagalog doesn't allow word-final -h.
I've read hundreds of medieval (Tang period) manuscripts from Dunhuang in which semi-literate students were practicing handwriting. The ill-formed characters of this woman and the repeated words have somewhat the same flavor. I've even seen oracle bone inscriptions (circa 1200 BC) that were clearly for purposes of practice and consisted of plenty of repetition. Even in the recording, there's a lot of repetition (e.g., "Bihar" and "idiosa India", esp. the last expression, which her interlocutors repeat toward the end). That (the repetition), plus the free association (Mig 21, Spinoza, Ang Sui Ki), make me feel that this may indeed be a type of Princess Caraboo imposture. Note that, even though she is at a refugee center, in the recording she does not seem particularly agitated, which leads me to believe that she is consciously affecting a pose, including a language and a script. Of course, both the language and the script are based on things that she's seen and heard, with the bulk being her own native tongue, but she's adding all sorts of other things that she's aware of, which is why the repertoire is, on the one hand, repetitious, but also very scattered. Does anyone recognize any consistent grammar clues? There might be a few, but I think she's mostly spouting single lexical items, and not in any good order. The base phonology, which she cannot escape, is her own and is relatively consistent. Why would this woman do this when she is a refugee seeking help? I believe that she decided upon this ruse as a way to keep from getting sent back to wherever she comes from, which is probably undergoing some sort of stress or strife. Could mental illness be a factor? Also, Greg Anderson should take a stab at this. In addition to the possibility that the woman is intentionally deceiving people, I wouldn't be surprised if she had some physical or mental illness affecting her language, perhaps but not necessarily connected with whatever events sent her to the camp. Or do aphasias and insanity typically cause different patterns? I don't think mental illness affects handwriting or vocabulary. It may affect the expression and contents of coherent expression based on proper grammar, but basic words and written record should be the same as those who do not develop mental illness, especially when she write in her mother-tongue. omg! Spinoza! MIG 21! she must be a deciever. I mean, who except for us knows who Spinoza is. Right?! She heard the name and just wrote it down. Must be. yes. I do not understand her, so she must be an imposter. Unbelivable. You people should find another hobby/job (I hope you are not linguists!!!). @ASEAN_GUY I'm not sure why it would be Mizo, which as far as I know has a typical SEA CV(N) kind of syllable structure, and which is mostly spoken in Chin State in Burma and contiguous areas in Bangladesh and India. That's a little far south to end up in Nepal, I would think. I also don't see much of anything that looks like Sanskrit (or Pali) in the writing either. In my experience, speakers of Indian languages often see traces of Sanskrit (or Tamil) where others don't–a kind of linguistic paronomasia or something. There are a lot of Pali borrowings in Burmese, but this isn't Burmese. One thing I'm struck by is the roman alphabet. Most languages of the area use Brahmi-derived scripts, right? Or, to the north, Chinese and Chinese-influenced. Are there many languages in the area that have a Roman writing system? Am I the only one who doesn't hear "idiosa India"? The first time (at about 00:25) sounds and looks like 'd', but the token also sounds like a speech error (assuming the whole thing isn't just glossolalia or deceptive nonsense), blending "India" and something else. After that, every occurrence of the word where she's speaking at a normal rate looks like it has a voiceless interdental stop. VOT is around 80-90ms, which means voiceless, and could be aspirated or unaspirated depending on the phonological inventory. I'm not sure she's producing any meaningful sentences or using a word from her native language in that phrase (that thing at 00:25 makes it seem like an improvisation), but if she is I think that word that's getting repeated is 'itiosa'/'itʰiosa' or maybe 'itio', 'sa', since 'sa' looks like it occurs pretty frequently on its own. I'm thinking about Victor's question about regular grammatical clues, which could say something about both her native language and the neighbor languages she could be using features from. It seems like Hindi could be one of the latter (and supported by context); it looks like she's putting something like the copula 'hai'/'haiN' in a lot of places. Please re-read the comments, it appears you may have some reading comprehension issues. Nobody is suggesting that the mere use of words like "MIG 21" or "Spinoza" means she is being deceitful. What we are suggesting is that some of the aspects of the text (and perhaps the recording as well) indicate that it is extremely unlikely to be a sample of normal language use. There are several reasons for this conclusion, for example, the rate of repetition seems to be too high, the fact that the non-Latin characters appear to be doodles rather than any real script, and the higher-than-normal frequency of what appear to be proper nouns. I would vote in favor keeping open the possibility of mental illness being a factor. I had an experience many years ago with a Vietnamese refugee who had two private "languages" which he wrote and spoke. One was highly polysyllabic and written in basic Roman letters. The other was written in Quốc Ngữ and closely resembled Vietnamese but was totally incomprehensible, at least according to the Vietnamese-speaking relative who accompanied him. He also spoke Vietnamese (I couldn't say whether normally, but I assume so) and bits of English. What was the diagnosis of the Vietnamese refugee? I don't remember a diagnosis. I think they were still trying to figure it out. From Zothani Khiangte at Manipur U. (via Mark Bender): “not even remotely Mizo”! Not sure if anyone has pointed out that some of the non-Latin characters are clearly Chinese, esp. near the beginning. After "ouiaah", the 6th char is "zhong" (China/middle), the 4th is "nü" (woman), the 3rd looks like a cross between "liu" (nine) and "wei" (for), and the 12th (6th on next line) is "mu" (mother). Also, the first two look like Japanese Hiragana "no" (of), while the 2nd on the next line and the 1st and 3rd after "spinoza" also look Hiragana. There's a couple elsewhere that look like "qi" (seven), and a few of the rest look like vague attempts to make Chinese-like chars. Also, just before "MIG 21" it looks like "DOh" (as in what Homer Simpson would say), and both of these look very much like how graffiti taggers would write these words. So I wonder if these aren't simply pieces of graffiti she saw. Underlined "bliss" and "NITA TINA" also seem like things you'd see in graffiti. If the writer had some education, that might explain the Chinese and Japanese chars (all of which are extremely common symbols, the kind you'd learn early on), as well as possibly "spinoza" and "tbilis" (= Tbilisi, capital of Georgia), maybe also "bricht" (= the writer Brecht? ), which might be randomly remembered words that stood out because of their phonetic structure. I gave it a quick look and seemed to recognize some Bengali or Hindi (with Sanskritized words) in it (like hasta pe — on the hand). I will take another look and listen to the recording. This is clutching at straws somewhat, but "MIG 21" might be another hint towards India, since India operates the largest remaining fleet of MiG-21s and they're a common topic in the Indian news media (thanks largely to their terrible safety record). @BenW Those are completely malformed Chinese/Japanese characters, if that is what they are meant to be (which seems highly unlikely). Someone who doesn't know Chinese/Japanese writing and is trying to reproduce the easy-looking characters MIGHT come up with those, but anyone who actually knows the language will produce something very different. The orientation and stroke count are the giveaways. More generally, couldn't be non-deceptive (and not mental illness! You can't diagnose these things over the internet) but just a private note? Maybe one written by someone who knows more than one language? Code-switching for speed or personal convenience can definitely produce a page of notes that are incomprehensible to anyone else. I know this because I do it often with the three languages I am fluent in. Could this just be playful writing? Perhaps by someone who enjoys writing and did not have access to paper and pens for some time? Or that she was given the pen and paper and told to just scribble anything, because they could not understand her spoken language? And while I'm guessing: I thought some of the characters look like caricatures of Katakana from someone who has not properly learned them. "Sanskrit-derived" is his own description of his first language, but fwiw, WP agrees that "over eighty percent of the vocabulary of Malayalam in scholarly usage is from Sanskrit". The person who sent the materials to us is a Vietnamese-American named Son Ha Dinh (Dinh Phuong Son Ha) who works for the International Organization for Migration, which must be affiliated to the United Nations refugee office in Jhapa, Nepal. Naturally, due to its location, most of the refugees they deal with in that office are from Bhutan. From what I know of the situation, the "Bhutanese refugees" are primarily ethnic Nepalis. I'm trying to extract additional scraps of evidence. @Dakota: Well, by that definition English is Latin-derived. And actually, a lot of people think that. I'm pretty sure that, as Ben W suggested, "NITA TINA" (l.7), "DOh", "MIG 21" (l.8) and maybe also "maLa", "apin" and "spinoza" are reproduction of some kinds of graffiti or, more plausible given their simpleness, wall tags. If those were from a nearby city someone would probably have recognized them, as their typically found all over where the tagger lives. So even if her intention is deceptional, she is probably in deep trouble if she came from a place farther away. Another hypothesis is that she is from rural area and thus not used to this kind of graffiti. Therefore she could have mistaken it for some kind of signpost and now wants to describe the way she came. Nanani, nobody attempted a diagnosis. Three people, including me, suggested mental illness as a possibility. An ethnic Chinese and once a student of Chinese paleography and epigraphy, I am 100% sure that the non-Latin form of script is NOT any kind of Chinese writing (excluding the writings of the minorities such as Yi and Nü Shu which I have no idea) and not the Japanese Kanji. For example, the fourth character to the right at the bottom line is so distinct that I have never seen in any script. The complexity of this character exceeds all others, making it possibly a key to the decipherment. For the mental illness issue, I still hold that this is not a factor on the lexical and phonological levels, though could be a crucial factor for meaning. The Vietnamese case David mentioned could be different since Vietnam experienced a complex history of script reform. My experience with people with mental illness (schizophrenia, major depressive disorder, bipolar disorder, post-traumatic stress disorder, anxiety disorder), many of whom even in psychosis, is that all of them can speak their mother tongue (English, Chinese and Russian) without any phonological and lexical mistake. As for writing, I am pretty sure that all these people I know who are physically able to write can write legible words, though perhaps not coherent in terms of syntax and logic. I even asked a Russian with major depressive disorder in psychosis to write something down and he can write the Cyrillic alphabet correctly in order instantly, and also legible Russian and English words. Vietnamese script is famous for its influence by a number of European alphabets, and its history and innovation from Chinese writing. So it may cause some complexity for the traumatic person. It will be more understandable if you can provide more information of him. The case of this Bhutan lady, however, is different that she simply wrote with two scripts: Roman and an unidentified. I once thought it was related to the script for some Munda languages but now it seems not likely as well. Another conspicuous feature is that her Roman script is written in two forms, the larger and the smaller. Also, some of them are underlined, some are capitalized. It seems that there is a natural transition between the smaller and the larger forms, but apparently the larger words indicate some kind of EMPHASIS, probably a reflection of her emotion. The underlined words, bliss, NITA TINA and SPINOZA, as well as the MIG 21, the capitalized word without underline. Could these alterations be viewed as some kind of trope that implies some of her thought? If this is the case, she must be highly active in thinking (and the record also shows her to be an energetic speaker), and I guess her mental illness could be either schizophrenia or bipolar disorder, illnesses that exhibit elevated excitation than other forms such as depression or posttraumatic disorder. After all, we need more information about the context, especially the proper names she mentioned for the whole scenario. Do we know where the writing was produced? Is this just some scrap of paper they found in her pocket, or were they trying to communicate and with her when she wrote this? If it's the former, and if these are common graffiti elements as was suggested, then perhaps the sheet is just someone trying to copy down the graffiti that they saw somewhere. (I can think of a gazillion reasons why someone would do this.) The weird "script" could be a case of her trying to copy down graffiti written in a script she didn't read or written in a style unfamiliar enough that she couldn't recognize the characters. (I don't know what graffiti is like in that area, but I've definitely seen plenty of graffiti lettering in the US where I couldn't make any sense of the letterforms. Anyway, some details on the context in which this was produced might be helpful. I couldn't find one wall tag of the crude kind, but after all that's not a thing likely to be photographed. You've provided very useful information! The graffiti can be classified into three forms: Roman-script, Brahimic-script and non-writing. So could the lady's graffiti be classified in the same manner? To me it is not decipherable at this point because mental illness, especially psychosis will greatly hinder a person's grammatical and semantic expression. The lexical and writing information alone is too meager. I agree, Gianni. What she is giving us, both in the writing and in the recording, is too random and unsystematic to constitute samples of real language usage. I'm trying to find more information from Nepal, such as whether the sample of writing was done before the workers at the refugee center or was a piece of paper found on her person. They cannot show us a picture of the woman, but they might be able to tell us more about her that will prove useful in cracking this very hard nut. 1. I don't have direct access to this lady. Another colleague of mine works with her in Kathmandu where she is living under the government's care along with other foreigners who overstayed their visas. This woman is not recognized as a Bhutanese refugee and doesn't have any identification document with her. I think right now she is noted as a stateless migrant or maybe illegal migrant. She entered Nepal from somewhere about 6 years ago. My colleague just came to know of this woman about a week and a half ago. Right now we are trying to pinpoint her native land, determine her ethnicity/nationality and then formulate a way forward for her from there. 2. She can speak some English indicating perhaps some formal education. The strange thing is she can't tell us her homeland or anything about her family except a husband who travelled with her and abandoned her. We think this "husband" could be a genuine husband or maybe just a human trafficker. 3. She is taking medication for mental illness. I don't know the diagnosis but my colleague thinks it was caused by the trauma of leaving her homeland (voluntarily with this "husband" or perhaps through coercion/force). Because of the mental illness, my colleague thinks she is highly susceptible to suggestions from other foreigners living with her in this government center. This could also make it harder for us to pinpoint her origin and explain the different writing systems that came up in the initial sample. For sure my colleague told me she was agitated when mentioning India, you can also hear it in the recording. 4. The writing sample came about when my colleague asked her to write something for her, so random words come up. 5. She said in English she is Mongolian. My colleague thinks she was just given that notion by another foreigner living at the center because other people in that center said the foreigner had been telling her she is Mongolian. After listening to the sound clip, reviewing her handwriting, and mulling over what I've been told about her, my theory is she is from a tribe in the NE part of India or approximate area (big area with plenty of tribes) and or from the NW-Kashmir region. I can't share her photo but from what I have seen, she could be anyone you would encounter in South to SE Asia, very big region to sort through. As for myself and the work that I do here, I am indeed a Vietnamese American. Fortunately I was able to retain my spoken-written Vietnamese while acquiring English after moving to the States as a child. The International Organization for Migration is not a UN agency though we work closely with many UN agencies, chiefly with UNHCR in many locations around the world. We are particularly good with logistical arrangement for moving migrants and or refugees even during crises and also performing medical screening for migrants + refugees for different countries that need such services. You can read more about IOM at http://www.iom.int. Here in Nepal we have our main office in Kathmandu and a field office in Damak where I am based. I've been here for over 4 years, working with the Bhutanese refugees referred to the US Refugees Admission Program by UNHCR. My work is supervising the national staff in counseling the refugee families, and ensuring that each approved refugee case undergoes all the necessary checks as required by the USG along with clearing all their medical screening before leaving Nepal for the U.S. I also have similar responsibility for urban refugees in Delhi and Islamabad. This area where I live is very rural with clean air and open space. My concerns are just lack of modern health care and reliable air transportation to the capital or to other country if an earthquake hits. I can't imagine the hardships you endured as a Peace Corp volunteer in the 60s. Wow! My hat's off to you. Despite the place's relative remoteness, I can still at least count on 12 hours of electricity every day (longer during the monsoon). Prof. Hansell (Mai Laoshi) probably told you that we are working on the identification of the unknown language that you asked him about. Although we've made a lot of progress, it would be helpful if you'd give us some additional information. 1. Did the refugee who spoke / wrote this language seem deranged or distraught when you were interviewing her? –> SHD: Under medication for mental illness. I can follow up with the diagnosis and revert. The comment from your blog about a Vietnamese with mental illness was very interesting. 2.Did she produce that writing sample in front of you? Or did she have it among her belongings already written out? –> SHD: The writing sample was written in front of my colleague after this colleague asked her. 4. Did she have anything written among her belongings? A magazine? Newspaper? Letter? Etc.? —> SHD: No personal belongings. We are pooling money to help buy basic necessities for her. Please read the following post and the many comments after it to see the kind of questions we're asking and the considerable progress we've already made. If you provide us with some additional clues, including answers to the above questions, we'll probably be able to solve this puzzle for you. So, if she is a polyglot, could "idiosa India" suggest paranoid schizophrenia? Could you ask Son Ha to specify the name of the medication, and the diagnosis if possible? The information Son Ha provided still cannot tell us if her paranoia or mania is caused by bipolar disorder or schizophrenia (or rarely, dissociative identity disorder). A good question for her is to ask her if she often hears voices from someone other than herself (such as a person, a spirit or a god). If the answer is yes, she is much more likely to have schizophrenia or DID, not bipolar. Since the manic episode of bipolar disorder can go away within a month or so, Son Ha and his colleagues can find the correct information after the end of psychosis. However, if her case is schizophrenia or the more rare DID (which I have never seen), the expected waiting time for her genuine information will be longer. Since she has been in Nepal for six years and still in psychosis, it is vital to know when she first received treatment and what the diagnosis was. Anyway, possible aid for her treatment should surpass academic curiosity in this case. "mental illness as a possibility"
And you and the others among us who thought that were right. 1. The group with whom the woman is associated in Kathmandu is highly multilingual, so she would be exposed to many languages and scripts. 2. Her writing, especially the non-alphabetical parts, looks as though she is making it up or experimenting with forms she had seen somewhere. See, for example, the first two non-alphabetical symbols toward the right side of the fifth line, and then repeated — mirror fashion — in the sixth line just below. The next character in the fifth line morphs into the following character, which she then twice modifies / refines in the following two characters / symbols. In the seventh line, the third, fourth, and fifth symbols from the right side are all variants / repetitions of a simple pattern that she had hit upon ( >< overlapping). There's a lot of this sort of thing going on in the last two lines as well. In the tenth line, "reh reh ras / vas sapa sapa" looks like she's just letting her mind wander. Below "Spinoza" we have "zuleh zuleh ala apin..." which must have sounded very nice to her. In the fourth line, "mamah aba so babeee" might be some form of "mother, father, and child" coming out instinctively. 4. In the recording, note how many times she repeats "idiosa India", and the more she says it the more agitated she becomes. Not sure if this is a chance coincidence, but we do have the word "idiosa" here. 5. It seems that she says "Bihar" a few times, at least once in close proximity to "idiosa India", which would make perfect sense (in her tortured mind), since Bihar is the India state that abuts eastern Nepal to the south. Perhaps the first thing in need is to do a CT or MRI for her brain to see if there is any lesion or the history of stroke. These could cause paraphasia and made spoken and written information useless until physically treated. Could you ask Son Ha for the diagnosis and the name of the medication, as well as the approximate beginning date of her treatment? A good question for her is to ask whether she often hears voices from someone in her mind other than herself (a person, a spirit or a god). Hearing voices is the sign of schizophrenia or dissociative identity disorder, cases much harder to deal with than bipolar disorder. Patients of bipolar disorder do not hear voices. All these mental illnesses can be the result of abuse and trauma. Son Ha's fifth point as well as writing and the records suggests that she is sensitive to proper nouns, a state often seen among bipolar people. Schizophrenia, DID or other complicate situation may also be possible. That was also in the back of my mind. The widespread use of MIG 21 around the subcontinent is only the 1979 USSR invasion of Afghanistan and the long-lasting war between India and Pakistan until 1999. If She is truly "Mongolian", could it also be the case that she is a Hazara people in Afghanistan or Pakistan? As for the word supposedly reading tbilis, I think it is unrelated. Note that the first letter of this word is different from other "t" in that the vertical stroke is written with a hook. Also interesting, the word after that, bliss, is written with an underline. Similarly, NITA is followed by TINA with underline. The word SPINOZA is also underlined, but the word preceding it, apin, is not underlined. Could the underline mean correction? That is, (t)bilis, NITA or TINA (one of them, I thought it was NITA because she might have underlined NITA instead of the purpoted TINA erroneously), and apin, are misspellings in the text so that we should omit them for reading. It is an interesting puzzle. It doesn't seem like Tibeto-Burman to me, but there is tremendous diversity in the family so that wouldn't rule it out. In fact many of the words in the written text are Indonesian names for people. Could she be listing people she knew? Some of the other words in the recording also sound like they might come from a variety of Malay. That doesn't make any sense if she is from Bihar, though. Have people tested the languages of Bihar to see if there is any match? If it is a TB lg of NE India, the people to ask are Stephen Morey, Alec Coupe and David Bradley. Long shot, has a Munda origin definitvely been ruled out? I wonder what to make of the fact that there's no brahmic script in the sample or at most very unskilled attempts at it among the other non-latin symbols. That does suggest that she either is consciously avoiding it, which improbable given that she's just showing her handwriting, or in fact not trained at it. She has however received some formal education, as her knowledge of the English language an the roman alphabet indicates. So is there any language in the region predominantly written with latin letters? It may not be the one of the sample, but still could be the one she was educated in. Also I wonder if it would be helpful to have her naming some specific things the way, cliché wants it the 'explorers' learned the indigenous languages, so those words could be compared to a list of those from the languages in question. I think it would make sense to focus more on the recording, as the written sample appears to be little more than gibberish; the recording, while it might not be in any real language, should at the very least give better hints as to the speaker's native language. "I wonder if it would be helpful to have her naming some specific things"
Yeah, I would think that a recording of some kind of modified Swadesh list (with pictures if need be) and some counting and the language (or at least family and branch) should be pinned down relatively quickly (including the small possibility that this is a Princess Caraboo situation). Referring to the Swadesh list is a good idea. But is there a database for the Swadesh lists of all South Asian languages? My comments about the possibly Chinese writing were meant to suggest that they may indicate some long-ago basic training in Chinese writing, not that this was an actual attempt to write something in Chinese or another language. It seems very clear to me that the non-Latin symbols are basically doodles, e.g. 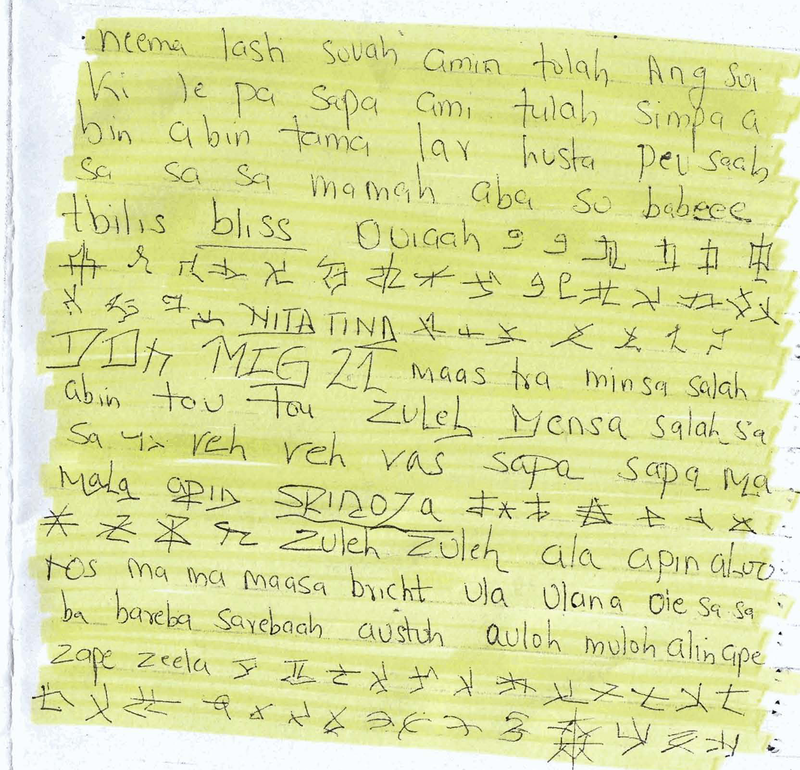 she might have been attempting to create something that looks vaguely like some of the non-Latin abugida scripts that she had seen around Nepal. The appearance of Chinese-like symbols might indicate that she had had some education long ago in writing Chinese, which might indicate that she grew up in some part of China. The fact that she doesn't seem to actually know any Brahmic or other abugida scripts could also be indicative of this, and the fact that the possibly-Chinese symbols are mangled just suggests to me that her knowledge of the characters is rudimentary and only half-remembered. OTOH it's also possible, as Erik suggested, that she might simply be copying forms she had seen in graffiti or on signs, although if these forms were Chinese that still might indicate something. I don't think the non-Latin chars, and probably not the message at all, could be written in a private language — it looks too disordered for this. @Marcos — I agree that the recording is more likely to reflect an actual language. However, it's interesting that most of the Latin portions of the writing seem consistent in their phonology — e.g. one-to-three syllable words, mostly open syllables, long vowels indicated with double letters, frequent h at the end of words that might indicate breathiness, creakiness or other prosodic feature. This might well be the phonology and writing conventions of her native language. I realize Victor already got a response that at least something from the sample was 'not even remotely Mizo', but now that we're accepting the possibility that the evidence only represents some kind of perturbation of her actual native language, or maybe just something made up and vaguely influenced by languages she knows, I think it's worth considering some of the support for the connection to that family. I was looking at Zomi. The first three lines are relatively smooth, indicating a plain narrative. @Liberty's suggestion that the first two letters can be her name is quite possible, as Neema is attested as an Indian name (I searched facebook and found a Neema in Delhi and another in Mumbai), and Lash is Anglo-American. "Sh" is neither present in the rest of the text nor in her speech, so this is perhaps a name unrelated to the language, possibly suggesting adoption, pseudonym or the name of her former husband. Kamla Bhatt's Indian affiliation may suggest it is a custom that Aung San Suu Kyi was called Ang Sui Ki among a group of Indian people. Interestingly, Kamla grew up in Chennai, Tamil Nadu and attended a Christian school. Chennai, formerly Madras, is famous for its Portuguese and French cultural influence. While the language of this lady is perhaps not Hindi or Assamese, exclamation words spread from languages profoundly. Could the two lower case words "maas tra" after MIG 21 indicate Maharashtra? Interestingly, the name SPINOZA, the only all-uppercase surname in her writing, is Luso-Hispanic, not Dutch. The famous Baruch Spinoza was originally a Portuguese Jew. Therefore part of her history could be relating to a Portuguese-heritage person/family. All the above suggests her association with India (comprising Indo-Iranian, Tibeto-Burman, Austroasiatic/Munda or Dravidian elements), not those remote places such as the Austronesian speaking countries or China. Her last words "itiosa India" might not be a blame (not idiosa because this Spanish word is unlikely to have spread to India and Nepal, and also as @chh pointed out, it is more likely to be "itiosa") but an imperative, which I guess is a request for her return to India. 95% of Chinese characters are compounds composed of at least two parts spatially separable within the sign unit. However, I don't see any of the lady's non-Latin signs separable, let alone the absence of any similar sign to Chinese except the one @Daniel Tse mentioned. Most of her signs are less than three strokes, but the average strokes of Chinese characters are around 9 (http://technology.chtsai.org/charfreq/). Only the sign I mentioned in a previous reply achieved this complexity. I don't think she has any training in Chinese, even informal. The suggestion that she doesn't know any Brahmic script is perhaps too early. Variants of Oriya and lots of scripts for Munda languages are still not ruled out by experts. 2) while I'm no expert, said individual has apparently been exposed to multiple languages but displays S/SE Asian language as default form. divergent forms of writing appear to be echos of 'graffiti,' but given 1) difficult to say. I will go out on a limb and guesstimate subject's 'native' language is either Bhutan (1st choice) or possibly something more Nepalese. Gianni Wan asked if I received any new clues from Austroasiatic and/or Tibeto-Burman specialists. So far, I have posted anything of significance that I received. I expect to receive more information from Son Ha Dinh and others. Will post anything useful that comes in. Right now my thinking is that the woman is mentally so impaired that neither her writing sample nor her spoken sample can be used to determine her native tongue, although they almost certainly contain valuable clues, many of which we have discussed in the comments. With our current state of knowledge about the woman, both her writing and her speech come across as very "mischlich" and disjointed. Thinking about this a bit more, most of the languages of the Indosphere, though not all, have three or more manners of articulation and more places of articulation for the stop series, which are not attested in the writing sample. It’s also notable that the voiced stop series has a clear /b/, but no /d/ and no /g/ (except for the loan ‘mig’ and in ‘Ang’, which may be part of a loan ‘Ang Sui Ki’ or is a part of an engma). As Uri Tadmor has elegantly explained above, it’s possible that similarities between the writing sample and Bahasa Malay/Bahasa Indonesia may be due to the greater statistical chance of similarity with a simple syllable structure and a limited phonemic inventory. Nevertheless, it’s certainly noteworthy that: several linguists have noticed possible Malay or Indonesian words in the writing sample AND no one has identified possible words from other languages in the romanized portion of the writing sample (with the exceptions of ‘hasta pe’ and the Hindi copula, as noted in two different comments above). http://language.psy.auckland.ac.nz/austronesian/search.php, produces a number of possible matches, *but* these are from various different languages. Even these possible matches may well be spurious because these are monosyllabic and disyllabic words with simple syllable structure and small phonemic inventories. Additionally, looking through text in various Austronesian languages available on the Internet, while many of the languages have some mono- and bisyllabic words, most seem to have many polysyllabic words, too. For the sake of thoroughness, here are the words which produced matches in the database (‘? ?’ indicates the meaning was fairly odd): amin, sapa, ami, simpa? ?, tama (‘husband’ in various, also other meanings), lav? ?, peu, sa, mamah? ?, aba? ?, so (‘and’ Asumboa), maas, tua? ?, tou, ya (‘I’ in various), reh? ?, vas? ?, ma, mala, ros, maasa? ?, ula? ?, ulana? ?, alin, ape. There are relatively few Tibeto-Burman languages which are not tonal; however, there are some in the greater northeast India region. A quick search of the STEDT database, http://stedt.berkeley.edu/~stedt-cgi/rootcanal.pl/gnis, shows three or four matches with Northern Naga languages (tou, ula, aba, ami), Angami languages (ole, ami, zope), Zeme languages (mala, tama, peu), Bodo-Garo (mala, ape, tama), and Chin (tou, reh, ami). The phonetic inventories of these language families, however, are more complex than that of the sample (http://stedt.berkeley.edu/~stedt-cgi/phon_inv.html?page=49, may be a bit glitchy to get this to run), so these do not seem to be likely candidates. Additionally, there is the same issue that these are mono- and bisyllabic words with cross-linguistically common sounds. (a.) a native speaker of a Kuki-Chin language closely related to Mizo says it is not Mizo. (b.) a fluent but non-native speaker of Indonesian says, “a few of the words look like Bahasa Indonesia or Malay (like salah means wrong or error) but I don't recognize most…” and has seen ‘peu’ in Acehnese but is not sure of its meaning. (c.) a fluent but non-native speaker of Urdu says the accent sounds Bengali-influenced. (d.) a colleague from NW India does not recognize it. (e.) a Bengali speaker thought it might be Nepali, Mizo, or Khasi. (f.) two colleagues who work on languages of Bhutan say, “ It's definitely not anything in Bhutan. It's not Nepali or Assamese, either. In fact, it doesn't sounds like anything either of us have heard in NE India (including Khasi). The closest thing we could come up with is Pashto (based on watching the movie Afghan Star). So, maybe it's worth checking out some other Indo-Iranian language from Pakistan or Afghanistan? (btw: sala is also a word in Hindi for wife's brother, but often used as a curse)”. Thanks very much for your excellent research and you and your colleagues' important comments. While many languages are ruled out after your filtering, do you or any of your colleagues have ideas about Austroasiatic (especially Munda) or Dravidian connections? These two language groups are highly influenced by Indo-Aryan languages and may contain a great number of borrowed words/expressions from Indian languages. Much of the "Malay" feel of the written document is, to me, because of the many words ending with -a or -ah. The recording also has an abundance of phrases ending with both /-a/ and /-ah/, so the writing is probably aimed at representing the same language. Looks and sounds like schizophrenic speech, with vaguely TB phonology but simplified. Maybe some Chin/Mizo elements, but not intelligible as such. The non-Roman writing bears no resemblance to any indigenous logographic script of China: not Yi, not Naxi, and of course not Chinese. I am not familiar enough with the Sgaw Karen 'chicken track' script to know whether it is like that, but maybe that should be checked. May I send this to a former student who works on Karen? In the second recording, /itioza/ appears (without /intiya/) around 0:08. The absence of a full series of voice stops (only b, no d or g) suggests glossolalia. The phonology is simple and repetitious, both features of glossolalia, which is similar the world over regardless of mother language. Still, I think that some real language is seeping through, both her native tongue and some of the languages that the woman has come in contact with in the refugee community / camp with which she is associated. Ladino is a variety of Spanish, and there is nothing Spanish about the language(s) of the documents. But Spinoza here could be someone's name. Portuguese names are not unknown in India. This is a long shot, but when I did some searches similar to what Liberty did, I found interesting matches with Marathi. I dismissed them because I thought Maharashtra was to far away from where she was found, but now that someone else brought up the possibility that she actually said Maharashtra, maybe someone who knows something about Marathi could look into it. Pretty sure it's the equivalent of "speaking in tongues". Deranged pentacostalist lost in the Himalayas? Just want to add that it might be worthwile to consider wether the first four lines come from a kind of nursery rhyme. That would explain some of the repetitions, and a supposed "sa sa sa, mommy, daddy and baby" would be the refrain. They actually even "sound" a bit like a song. The rest of the writing could then still be just a handwriting sample. The frequently mentioned proper nouns such as Marathi (Konkani), Spinoza, Pentacostalism, etc. suggest Christian connection. The absence of retroflex consonant also indicate her unfamiliarity with Sanskrit and Dravidian. So I guess her religious affiliation is not Hinduism but quite probably Christian. The other prevalent religious affiliation in this region, Islam, is not evident in her speech either. I think it is reasonable that she didn't say Bharat even if she speaks an Indic language. The addressee was the UN staff who do not speak her mother tongue, and she must have known that she was in the land other than India. Why she had to say Bharat, a word a UN staff may not know? Mental illness does not necessarily prevent one from recognizing the context of speech. Gianni, I am a bit confused. Are you saying there is a correlation between religion and phonetics? Would this mean that Utsul and Songhai are related, or Quiche and Tagalog? Please explain. I agree with Uri Tadmor on this one, the written text looks a bit like Indonesian. But having listened to the sound files, I would have to say that it doesn't sound the least bit like Bahasa Indonesia or any of the well-known languages of Indonesia. Like Uri, it also reminded me of ritualistic or shamanic language. Another possibility that came to mind is that it is a ludling. Note the high frequency of certain sounds, especially sibilants. I would recommend that experts in languages of the region select a couple of the most likely languages, and try to derive these texts from such languages by the application of ludling-style rules, eg. by adding syllables with sibilants all over the place. Yankee Modi and I both agree that this sounds nothing like an indigenous TB language of the North East; the phonology, especially the prosody, is quite different, and sounds much more (north-)westerly. Also, if I remember correctly that the woman is reported as knowing some English and (thereby?) showing signs of being educated, it would be astonishing if she were from the North East and yet knew no Hindi, Assamese or Nepali whatsoever. Cheers, Randy, by the way. In India, if both language and religion are strongly correlated with geographical area, then apparent unfamiliarity with the languages of some religions can help pinpoint the origin of the writer. Although there are very old Christian communities in India (older than in some European countries), the writer seems to be more closely connected to modern Protestant missions, as shown by her basic knowledge of English and her writing in the Latin alphabet rather than in an Indian script. Has someone tried to determine her religion by showing her typical symbols? Of course, this might not work if she is trying to hide her past. The Christian mission interpretation has a bearing on considering the text as an instance of "speaking in tongues" (as Adam Smith suggested), a feature of Pentacostalism, rather than a pathological glossolalia. "Speaking in tongues" (and believing one speaks an actual foreign language, which is decoded by an "interpreter") appears to happen to people in a kind of religious trance, which does not seem to be the case here (unless, if she is bipolar, she speaks in tongues during the manic phase). But if she was educated in a Pentacostal mission, she may be deliberately trying to speak and write "in tongues" in the hope that her speech and writing will be understood by someone who speaks the same "tongue". The underlined forms seem to be proper names (even "bliss", which occurs in English as a last name), which of course would not be part of the vocabulary of the "tongue". Not phonetics. We are here to identify her origin, so it is task-oriented. Please be aware that we are talking about her language, not in the narrow sense of phonetics. Religious affiliation is linked with certain ethnic group. For instance, most Japanese speakers are not Muslim. Regarding her situation, @marie-lucie has made a keen examination. Her reference to Latin script and Christianity is especially crucial. Based on my observation during my social work with bipolar people in the manic episode in the US, they do not speak in tongues. But I don't know the situation in India, and of course the people I worked with were not closely affiliated to Christian mission, though they sometimes refer to the God. Thank you for your valuable time as you try to figure out the lady's native language. I read the comments daily. Just a brief update from me: my colleagues from the various IOM missions around the world couldn't identify the language. I have heard Mizo and Tedim in my work and this doesn't sound the same. Nothing heard from the Philippines and Indonesian missions so pretty safe to rule out Bahasa or Tagalog. Because of what you all wrote, I will re-check with my colleagues in Myanmar if they have the access to other tribal languages outside of Chin. I also didn't consider the religious angle but now will check for her religion @Gianni: I don't have the medical diagnosis but some of the comments were insightful and I will follow up with my medical colleagues. Thank you again and in peace. I really admire your work. I hope one day I can be a UN employee for refugees and especially those with post-traumatic mental illnesses. Her diagnosis is crucial because if it is some types of schizophrenia, the true language will be very very difficult to be detected. I've just listened to the two recordings. I'm fairly certain that neither of them is Marathi. The first one does sound like an Indian language, and there are some recognizable words — especially "itihosa indiyaa," which would presumably mean "history of India." The other one sounds even less like Marathi to me. I thought I recognized the word "Sufi," but then she corrects herself and changes it to "Suze," or something like that. The non-Roman characters have a stylistic similarity to the Phoenician alphabet or something derived from it. Along those lines, given the geography and the reference to Mongolia, the non-Roman characters also have some similarity to the Old Turkic script or the Old Uyghur alphabet. More generally, the notion of some Central Asian language transliterated into a Cryillic derived script is a plausible possibilty. Some of the characters in the Palmyrenean script (West Aramaic) or Judeo-Aramaic look quite similar to hers. South Asian and Southeast Asian and Arabic scripts are all very curvy and cursive. The non-Roman characters here have none of that flow and are very blocky. @Gianni: I did not mean that the woman might speak in tongues because she was bipolar (something we don't know yet anyway), I only suggested that a bipolar person familiar with Pentacostal practices might engage in this activity more readily while in a manic stage. But I am not a psychiatrist or even a psychologist. You saying that we are talking about "language" rather than phonetics "in the narrow sense" does little to explain to me how a sound clip can "sound" Muslim or Christian. For example, you said "The other prevalent religious affiliation in this region, Islam, is not evident in her speech either". Tell me, hearing a recording of a Hui Muslim from China talk about the weather in Mandarin, could a non-Chinese speaker tell that they were listening to a Muslim person? Language and religion can be related in some ways, but it is literally impossible to tell the religion of the speaker of an unknown language just by listening to them. It isn’t like any Tibeto-Burman language of NE India that I know of, and it doesn’t sound like it has lexically contrastive tone either, in contrast to the vast majority of T-B languages of that region. My partner is a native speaker of Nepali and Nagamese, grew up in Nagaland and Meghalaya, and has a very good knowledge of Hindi and related I-A languages, and she couldn’t recognize anything in the recording either. Sorry that I can only offer suggestions as to what it isn’t. I agree with the last sentence in your last post. What I meant in the quoted text is that we can't find clues for religious practice in Islam or anything relating to it. This of course does not exclude the possibility of her affiliation to Islam. However, other clues, as @marie-lucie and others pointed out, indicate Christian affiliation. I think Christianity and Islam is mutually exclusive in most countries so this is useful for narrowing down her identity. For example, most TB speakers could be Christians but not Muslim. Of course, there is nothing absolute and there is conversion. We live in communities, even she converted from Christianity to Islam, she has a Christian past. One's tongue can change, her/his history cannot. Exactly. I agree. One of the most conspicuous features of the manic episode is hyperreligiosity. It's possible that the speaker learned to write in Latin script first of all, if she's come under the sway of Christian groups. Bible portions for many languages in this part of the world have often been produced and diffused in local languages in a variety of scripts, both local (say Oriya or Bangla) and Latin. Listening to the recordings, it doesn't sound like there's lexical tone, and the intonation pattern, syllable structure and phonetics are similar to the mon-khmer languages I'm aware of in Meghalaya. Keep in mind that though it's not Khasi or Pnar (and I don't think it's War), there are a lot of smaller local varieties in the hills of Meghalaya which are prime candidates. Given that this lady is now in SE Nepal, and that she seems to vociferously indicate that she is from India, (the first recording seems to be of her telling how she arrived in Nepal) she may be from NW Meghalaya near Garo country, where there have been insurgents in recent years. though the structure's not exactly right. Also, the voiceless velar fricative (x), voiced sibilant (z) and voiceless uvular stop (q) found in the recording are not found as phonemes in Khasi or Pnar, though possible in varieties further west. All this leads me to think that we're dealing with a Mon-Khmer language of NE India, specifically NW Meghalaya. I'll check with a couple friends who are working on some of these languages, maybe they have a clearer idea. If Hiram is on the right track then the non-Roman characters are probably simplified version of Assamese script which was used in the 1800s to write in the relate Khasi language before the Latin script was used. If she speaks a rare Mon-Khemer language there may be very few written materials written in it and some may have been taken down in each script requiring literate people in that language to learn both scripts. Notably this state would be one of the few majority Christian, majority tribal states in India in addition to being close. One example of a minor Mon-Khmer language in the region, War-Jaintia, which from that region and is taught in elementary schools does not have a firmly established written form of its own and is classified in Ethnologue as unwritten. Apparently not all of its sounds are well reflected in a Latin script, which could explain the code switching between two kinds of script. The handwriting looks like the carefully formed letters of someone who has maintained an elementary school education into adulthood but has to think carefully about making each letter, rather than like that of someone who has written a lot during life and does so as a second nature commonplace reality. The language is most certainly not Marathi or any other South Asian Indo-European language from the past 1500 years. Just to spread the good news that though we haven't been able to identify her native language, we have the government's permission to bring her outside the center for treatment. One more language to remove from the checklist: Kashmiri. A native speaker listened to the sound clips and ruled out that possibility on Friday. It has been mentioned already that the language isn't any South Asian Indo-European language, but as a native speaker I'll confirm that it doesn't sound Bengali at all. /v/ and /z/ are not present in Bengali, and /s/ is very rare. Phonetically, the recording sounded like it might come from Assam or parts northward, although the words didn't sound Assamese. Having read through a most of the comments, it seems like the prevailing premise is, that the womans speech samples and the notepage does indeed represent an existing language and is not just a hotch-potch of phonemes? Could someone please explain convincingly why that should be the case? Before concluding that the speech samples are simply "a hotch-potch of phonemes" (actually suggested by the hypothesis of "speaking in tongues"), and declaring the woman to be either crazy or a faker or both, it is only fair to rule out actual languages, including those spoken in very small, remote areas and practically unknown to people outside those areas. Two quick thoughts. 1) Regarding names such as 'Spinoza', some people from schedulded castes in India (some Bhils, I'm told for one thing) do have Portuguese surnames, and Espinosa is fairly common. 2) Could /itihosa/ be a learned loan into the language (meaning 'histoiry', orignally from sanskrit, as people have so far pointed out ) from an Indic languiage like Bangal or Assamese which has quite back forms of /a/? Though I do like the idea that it may be a language related to Khasi (a language which was first romanised by Welsh-speaking Presbyterians, I'm told). I'm enjoying this long-running murder-mystery, uh, I mean mystery-suspense thriller. I think we've, uh, I mean you've, covered a lot of ground and made a lotta progress. It is because a person with mental illness do not speak nonsense, contrary to some common beliefs. Most people with mental illness speak comprehensible words. Quite a few of them may express with distorted meaning and corrupted syntax, but as lexemes, understandable. However, if she has a history of brain injury or stroke, her language ability might have been impaired. That is why I suggest the UN staff to do a CT scan or MRI for her. I would be reticent to describe this as a 'hotchpotch of phonemes' but it does seem extremely unlikely that this is one language. Orthographic codeswitching of the kind here is not particularly uncommon; to me this person is likely to be multilingual, though perhaps with a low level of competence in some of the codes evidenced here. There do seem to be some Filipino/Malay lexical influences and the Hispanic features (mamah aba so babeee, espinoza) would perhaps also point in this direction. But the consonant clusters in bliss, tbilis and bricht are at odds with the syllable structure of the rest of the document which points very strongly towards codeswitching- the motivation for this is anyone's guess. It could be unmarked and vernacular or it could be due to mental illness or indeed chicanery. I suspect that if no-one has worked this out by now, then this woman probably speaks a minority language as her L1 but has a low level of competence in various other languages to which she has been exposed. Could "bricht" be a spelling error for "bright", which could be a common English name (like "bliss")? none of the words on the page has the digraph "gh" or the sequence "br". I think we're not done with this yet, even though it has moved off the first page of LLog. A brief reply to marie-lucie's latest comment: I'm not sure what is meant by saying that "none of the words on the page has… the sequence 'br'", since "bricht" is right there, and I don't think that "bricht" is necessarily a spelling error for "bright", inasmuch as "-icht" is a typical German ending, and she may have picked up some German along with all of her other polyglot exposure. Now a few additional observations about her writing sample. 1. One of the most conspicuous features of the alphabetically written portion of the sample is that she repeats the "word" (if that is what we make call it) "sapa" three times, once in immediate succession. She also writes the single syllable "sa" seven times, once three times in a row and twice two times in a row! These are very simple syllable structures (sibilant + open vowel and bilabial + open vowel). There are also other similar sounding "words" that are repeated, e.g., "salah". 2. "NITA TINA" seems to be an auto-correction or simple variation on a set of phonemes. 3. The propensity for repetition of simple terms in succession, sometimes with variation, is noticeable, e.g., "tou tou", "zuleh zuleh" (total of three times), and "ma ma maasa", and there are many others that could be cited. 4. Most of her syllable endings are open and the syllable structures overall are simple. 5. The number of terms that end in "h" is remarkable (this has also been noticed by other commenters). 6. Similar characteristics — repetition plus variation of simple elements — are also to be noticed in the non-alphabetic portion of her writing. This part of her writing seems highly experimental, as though she were trying to create her own symbols from simple components, some of which she may have seen elsewhere. 7. Amidst all of this very plain, repetitive writing, suddenly we get occasional bursts of more complicated words, such as the much-noticed "SPINOZA" and "MIG 21". 1. This recording remarkably starts with this sequence: "sapa ha a sapa ha saha". Clearly she is experimenting with the same sorts of sounds as are prominent in the writing sample. 2. Something very interesting happens about halfway through, when she says "sophia / sofia se sofi" and then this morphs into "suze", which she repeats emphatically seven or eight times. 3. The word "itiosa / itʰiosa", which is so prominent in the first recording, also occurs in this (the second) recording. In general, the sound recordings seem more to reflect connected, natural language with intelligible grammatical properties, but — like the writing sample — they are filled with repetition and variation of the same sort as is seen in the writing sample. Even more than in the writing sample, however, they contain amazing strings of repetition, at times highly excited and agitated, e.g., the much remarked "itiosa / itʰiosa India" of the first recording. I'm still hoping that we might learn more about this woman, that she will continue to receive compassionate treatment, and that eventually she might be returned to her native place, if that is possible in light of the forces that drove her away from it. At the very least, it is my wish that she be reunited with one or more of her compatriots who speak her native language. Could the woman's mention of Sapa be related to the town and region of Sapa in Vietnam, on the Chinese border, where there are communities of Hmong and Yao people? It is also possible that this is some kind of ritual language, which would explain the repetition and code switching, including the intriguing "Spinoza." I've witnessed Yao rituals in Thailand, for instance, where ritual manuals were read in a mixture of Yao (Mien), Southwest Mandarin, and Cantonese. Tambiah talks about Sinhalese use of ritual language in this way in his article, "The Magical Power of Words" (See the last two sentences especially): "…they embody a subtle design which uses the notion of a hierarchy of languages. When Hindu gods are invoked and their origin myths are referred to, the spells contain Sanskrit expressions, no doubt distorted from the point of view of a purist. When the Buddha or Buddhist mythological elements are alluded to, Pali words are employed, once again portraying syntactical infelicities. When however the spell actually narrates an origin myth, the language used is that of the classical Sinhalese literary forms prevalent in the sixteenth and seventeenth centuries. Finally, when demons are directly addressed and commanded, the words are a polyglot mixture and therefore unintellible, being compounded of Sinhalese, Tamil, Pali, Sanskrit, Malayalam, Telegu, Bengali, and even Persian. This powerful and exotic mixture is the 'demon language.'" Interesting that certain words are underlined. As for Paula's suggestion, I've been to Sapa and there could be some kind of connection, though it doesn't explain the connection with Spinoza and bliss (both underlined) or any of the other linguistic elements, for that matter. I haven't seen anything similar in Yao contexts. I have a student who is Hmong (from Colorado) and could ask her, though I suspect it isn't Hmong either. We really need to find out more about this woman. Could she be some sort of medium? That's my offering to the layers of speculation. I'll keep thinking about it and see if I come up with anything else. Good news is that we raised enough funds for MRI and also expert diagnosis afterward. The diagnosis will be used for further treatment and hopefully with treatment, she can help us identify her origin. I have read of mediums in the northern part of Vietnam; they often appear during a village's festival or when a crisis strikes, speaking cryptic messages in Vietnamese for the village elders to decode. Tribes in Việt Nam also have similar mediums. The tribal groups spreading throughout southern part of China, northern Vietnam, and northern Laos are numerous, so if she is indeed from one of their groups then I look forward to reading about them here. Summary of the languages that the sample is NOT (from above comments and discussions with colleagues): Hindi-Urdu, Assamese, Bengali, Kashmiri, Nepali, Darma, Byansi, Chaudangsi, Khasi, Pnar, any of the TB languages of NE India, Nagamese, Marathi, Kiranti, Limbu, anything from Bhutan, Tibetan, Farsi, Hazaragi, Khowar/Chitrali, Burmese, Mizo, Lai, Tedim, Jingpho, Karenic, Sinitic, Na, Naxi, Yi, Japanese, Thai, Malay, Bahasa Indonesia or any of the well-known languages of Indonesia, and Tagalog. IF 'itiosa intiya' is a whole phrase *and* 'intiya' means 'India', this would eliminate Tibeto-Burman as TB languages are all verb-final with the exceptions of Karenic and Bai, which are tonal. IF the romanized part of the writing sample represents the phonology of the language, it has perhaps 12 to 14 consonants, and does not have the complex stop series (place/manner of articulation) found in Indospheric languages (whether Indo-Aryan, Tibeto-Burman, Austroasiatic, or Dravidian). As far as I know, the only non-tonal languages with such a simple consonant inventory in Asia are Austronesian (though please correct me if I am mistaken!) One colleague said she has seen 'peu' in Acehnese, though as far as I can tell via Google, the sample is not Acehnese. None of the Austronesian specialists have recognized the language, though there are hundreds of little-studied languages across Indonesia, Papua, and the Philippines… Another possibility is a creole, as creole languages often have small phonetic inventories. @Hiram's analysis of the sample as perhaps being a Mon-Khmer language of NW Meghalaya is interesting. Maybe SHD's colleagues could do a Google search for images of Khasi textiles and show them to the speaker to see if she has a strong reaction? SHD, thank you for your updates. It's great to hear that a diagnosis and treatment are on the way. I suggested to Eli Alberts that the non-alphabetical parts of the writing sample look a bit like the symbols on some of the ritual scrolls of the Yao people that he studied. The difference, I think, is that most of the characters in the Yao documents I've seen are possible to decipher as Chinese, with some interspersed that are some kind of local shorthand or possibly represent Yao words. I see only a few that resemble complete Chinese characters, and a few that look more like Japanese kana, particularly next to Spinoza. The underlining of specific words almost reminds me of the red lines that appear next to certain words in Yao and other Chinese ritual manuals, and the imperial-like stamps over certain words in Yao charters. In some ways, there is more of a resemblance with Woman's Script, in that they are like Chinese, but not completely. I'm still thinking it might be related to a spirit medium, such as spirit or planchette writing, but that's just a hunch and that doesn't help us locate where she is from. Thank you very much for your summary of the languages that she is most likely NOT speaking, also for the suggestion that SHD's colleagues show her Khasi textiles. I have obtained the close, informed analysis of a psycholinguist who has carefully observed the woman's writing sample and listened to her two recordings. His findings are extremely interesting and comport with much of what has been said above. As soon as I receive the psycholinguist's permission to post his analysis, I will make it available here. I've listened to the recordings and read the sample several times. What I would add to what has already been said would be to confirm that the spoken output shows a good deal of perseveration of single-syllable and multisyllable forms, to confirm that the native speech is not tonal, and to agree that the spoken output certainly seems pathological, though its nature and cause are unclear to me. My impression from the writing and speech samples is that it is more like a psycho-pathology (psychosis) that is either organic, traumatic, or due to ingesting a toxin of some sort, rather than an aphasia related to traumatic or vascular brain damage. If it turned out to be the latter ii would be a posterior aphasia because she is fluent and appears to have no motor deficit either in pronunciation or writing. Also if it were the latter, she would have comprehension deficits, which I haven't seen mentioned. I was extremely pleased to receive Jerry Packard's professional analysis of our subject's speech and writing. What Jerry says confirms so much of what we've been saying, but he puts it on a more informed and scientific basis. It is especially intriguing that Jerry finds the deficits in her speech and writing to be "more like a psycho-pathology (psychosis) that is either organic, traumatic, or due to ingesting a toxin of some sort, rather than an aphasia related to traumatic or vascular brain damage." This fits perfectly with our hypotheses that her language production may be strongly conditioned by trauma and / or psychological states attained during glossolalia or shamanic (spirit medium) performance. It will be very interesting to see whether, and to what degree, the MRI results substantiate our findings made on the basis of the analysis of the two recordings and the writing sample. Eli Alberts mentioned that the non-alphabetical symbols in the writing sample reminded him somewhat of "women's writing", i.e., nǚshū 女书. I've often referred to nǚshū 女书 as the rhomboidalization of a large syllabary-sized set of Chinese characters, but our subject's symbols do not look like that. I still say that they are what I mentioned above: tentative repetitions and variations on simple graphic themes, some of which she may have picked up from non-alphabetic writing systems that she had encountered during her life, perhaps especially in the refugee centers where she has stayed, and some are just (mostly simple) forms that she has made up herself. Fascinating. I didn't mean to imply that I thought they were nǚshū 女书, which is used in a more coherent way, such as to write letters. I agree that what we see here seem to be "tentative repetitions and variations on simple graphic themes," though some words, such as "bliss" and "Spinoza," "中“ and perhaps other words are from known languages. The thing is, she might be doing the same thing in the recording verbally, and if she is a medium or has some kind of neurological disorder, it might not be possible to hone in on one specific language or to rule out languages completely, particularly if she is combining elements from a variety of languages. I guess one question is whether what she is doing in writing and speaking is something that only has meaning for her or if there is some broader cultural significance. Thank you professor Mair for posting Dr. Jerry Packard's analysis. I will bring this up along with some of the recent posts with my colleagues in Katmandu on Monday. News from me that I think either help or hinder us in our search. After reading of the possibility of this lady being a possible medium, I rechecked with my colleagues regarding her entry-point into Nepal and the answer is China-Nepal crossing north of Katmandu. This explains the characters in her writing sample. We also received the MRI result and nothing appears abnormal. According to a Muslim colleague, this lady appears to have deep understanding of Islam. In one visit during lunch time, my colleague heard her complained she can't take more "zakat" from the Immigration canteen, per my colleague an Islamic term for charity given to someone. To further test this theory, my colleague said an Islamic goodbye on her way out and the lady responded correctly by touching her fingers to her forehead. This is great. I believe this will help the searching. Her exposure to Christianity, as we discussed, and Islam, can narrow the candidates of her possible origin. Although she came from the border of China, there is no reason to connect her non-Latin symbols with the Chinese writing. As I mentioned in a previous post, the average strokes of Chinese characters far exceeds her symbols. Also, the cursive script or anything based on cursive Chinese (e.g. hiragana) is not written in her way. The most mystic symbol, the fourth to the last, is perhaps the key. Anyone can enter Nepal from China now, and as you said, her appearance is South Asian. So probably she came from somewhere north of the Himalayas but not ethnically and culturally Chinese. In spite of this, her origin can well be out of the borders of China. I just had a chance to talk with Dr. Deven Patel and he thought if she came from India, that might be somewhere in the Northeast, especially Meghalaya where highly mixed languages are present, and particularly, the unstable situation there could explain her status as a refugee. You might try some of the languages of Baltistan. I don’t think it’s Balti proper (an archaic form of Tibetan), but there are other strange languages spoken there. Some of them are not well studied. And I was thinking of Ladakhi. There are, I believe, some Muslim Ladhakis. One thing I don't understand: If they can perform an MRI on her, why can't they ask her where she is from and what language she speaks, or is there no one there who can communicate that much with her? Perhaps they could show her a map. Of course, familiarity with Islamic terms doesn't by necessity rule out the spirit medium connection, I think, though I'm no expert on Islam in Southeast Asia (Burma, Bhutan? ), Southwest China, or northern India, assuming she didn't travel too far. MRI is used for the diagnosis of brain injury, stroke or tumor. She is free from these problems so her language can deliver her intention. Otherwise, her speech is not language per se. Therefore the result makes us possible to further seek her origin. South's suggestion of checking out non-Tibetan related languages in Baltistan might be a good one. Neither Tibeto-Burman nor Burushaski has so many -h endings. I don't agree with Coblin and Schuessler. But could the writing related to the script of the Bon script of Zhang-Zhung language? Alex McKay is an expert on it. Perhaps someone could approach him for us. There is a substantial amount of Christians (5%-9% of the population), NOT Muslims, living in Sikkim. It is important that she has relationship with Islamic community, but the entry from China does not specify anything in particular. She could not have been a Xinjiang or Gansu Muslim traversed the Tibetan Plateau and entered Nepal. Instead, she might have been someone from India, either Christian or Islam in origin, and influenced by the other religion en route to China and Nepal. I prefer that she's originally Christian and influenced by Muslim people. The dark blue (not black) spot in the northeast of India on the first map is Sikkim, so this means that there is a substantial amount of Christians (5%-9% of the population) living in Sikkim. There are, however, Muslim communities in Southwest China, though I imagine she would be able to speak something like Southwest Mandarin, at least at a basic level, if she were from China. Myanmar? Victor, wasn't that your initial thought? "Government forces are continuing to persecute Muslims in Burma's Rakhine state after failing to protect them during deadly clashes in June, Human Rights Watch has said in a report. Security forces had killed and raped members of the Rohingya group and arrested hundreds of others, it said." I went to the Yunnan/Myanmar border in 2009 and recall that the border was very porous there, and people were clearly crossing back and forth, so perhaps she crossed from Myanmar into China and then made her way to Nepal. The area of Rakhine or Arakan has been under Burmese, British, and Japanese rule, and the British allowed migration between Arakan and Bengal, which might explain the mixture of scripts, including some that look like Japanese kana, in her writing. The current "government restricts educational opportunities for them," which could explain her linguistic difficulties. "The Rohingya language is the modern written language of the Rohingya people of Arakan (Rakhine) State of Burma (Myanmar). It comes from the Indo-Aryan sub-branch of the greater Indo-European language family and is closely related to the Chittagonian language spoken in the southernmost part of Bangladesh bordering Burma. It is not the same language as or even similar to Bengali as is often proposed in Burmese national narrative." I am not ruling out the possibility of this lady originally from India, somehow crossed into China and then entered Nepal. The reverse is also possible: born in China, studied in India, returned to China and then crossed into Nepal. Nepal and India has open border so if she is Indian, crossing in and out of Nepal wouldn't lead to her current predicament with Immigration. China-Nepal border is quite hard to cross back and forth. Both sides keep a strict watch on who's entering and leaving. @ Eli: After reading your comments I forwarded the sound clips to a colleague from Chittagong. It's not Rohinga and or Chittagong. Thank you for letting me eliminate another possibility. Certainly, I agree. She might be from either China, India or somewhere around the region. But the exposure to both Christianity (non-Islamic and non-Hindu-Buddhist terms such as MIG21, Spinoza etc.) and Islam suggests that she experienced history of these two different communities. While I am unable to find a map of Islam in China, it is certain that the only region where she could be influenced by both Christians and Muslims is Yunnan Province. The languages in Yunnan are extremely complex. I suggest any of us to consult Paul Sidwell or Norman Zide who know a lot about these languages. While Yunnan is a likely possibility if she is from China, I'm not certain that it is the only place in China where she could have picked up Christian and Muslim influences. There are Christians all over China and Muslims in several different provinces. I might add that Spinoza is not a particularly Christian name. He was a Portuguese Jewish philosopher from the Netherlands who questioned the authority of the Bible. She is not Jewish because Spinoza is Sephardic, a group not showing up in India. In contrast, Portuguese names are prevalent, such as George Fernandes, the former defense minister. He adopted a Protestant name (not the Portuguese Jorge), like Spinoza who Dutchified his surname de Espinoza, derived from a city near Burgos, Spain. My point wasn't that she is Jewish; just that the name Spinoza in her writing doesn't necessarily mean she has been influenced by Christianity, unless there are other reasons to believe she has. My question: Is she randomly picking words, or fragments of words, or things that look like words, or is there some bigger linguistic or cultural or religious significance? She might have heard the name Spinoza anywhere or it might mean something very specific to her. I know I asked this above, but has anyone showed her maps or even pictures of places in India, China, and Southeast Asia? Just a thought. As far as what I have known through social work with people with mental disorders, these words they utter are usually of momentous significance. As you suggested, these names must be important for her. The suggestion of a map is great too! I think Randy's comment that many of these words are names in Indonesian may be significant. When several of the words in the text appeared as names in Google searches, I tried combining words from the text with a known name (to weed out extraneous hits) to see if the words also were names. Many of the words turned out to be names in either Indonesia, India, or Pakistan. The following all appear to be names: neema, suvah, amin, tulah, (Ang Sui Ki), sapa, tulah, simpa, abin, tama, lar, salah, reh, vas, mala, apin, ala, apin, ula, ole, uloh, alin, zope, and zeela. 'auloh' and 'zuleh' also appear on Indonesian websites, though I don't know what they mean. Bahasa Indonesia is a standardized lingua franca of the educated register. It is highly influenced by Indian languages on the lexical level. I doubt if these words are ultimately of Indo-Iranian or Austroasiatic etymology and also prevalent in the Romanized forms of these languages, and the reason we cannot find them via Google is because the official writing systems of them are mostly not Romanized. Words recorded in other writing systems are not searchable by a Latin-centered engine like Google. SHD has seen a picture of her, it seems. I wish we could see what she looks like, but I know the UN rules probably make that impossible. Mair laoshi, I also wish I can show her picture :) Just this morning, she was permitted to enter a group home with frequent access to a psychiatrist and her own space. My colleagues and I are hoping that with proper care, she will regains her lost memories. IOM and two other international organizations will be responsible for her while she is outside of Immigration center. IANALinguist, so please be ready for some uninformed and wild guesses… it looks to me that a lot of those symbols could be diagrammatic rather than linguistic, especially the symbols after SPINOZA, which seem quite different to both the first and last set of symbols. It is interesting that Spinoza, who was an acclaimed lens grinder, is very close to something that looks a lot like a prism splitting white light into the spectrum. The diamond-like shape on the bottom might also be some sort of prism. Or gemstone. With some wild speculation and absolutely no grounding in anything, the diagram between Spinoza and the triangular prism might just be a destroyed bridge, or perhaps, and with absolutely no relevance to a refugee in Nepal (but marginally more to prisms and Spinoza), one could convince oneself it's a diagram showing that light cannot travel through two media with opposite polarizations. We can continue and get even (much) thinner: after the prism is a diagram showing total internal reflection, then focusing, then magnifying. If I haven't stretched this to the breaking point (and I think I have, but will go on anyway), the first three symbols of the next line might be indicating that straight (or parallel) travel is impossible, as is zigzag travel, but one has to go across an intersection (or perhaps crossing a road is also impossible). All of those are probably more plausibly attempts at diagrams that she gave up on when she realized it wasn't conveying what she wanted it to (think Pictionary). I think I'll stop now that I've taken this so far beyond plausibility and justifiability that I'm feeling a little intellectually dirty. Of course, I'm still not sure if that even says "SPINOZA"… why not add yet _another_ writing system: "ΩΙΠΟ/a" or "ΩΙΛΟΖa" – not that that adds anything to the meaning, but the S and P seem to run together a bit smoothly at the top. Yes, I know about Indic influence in Indonesia. I'm not trying to make a guess as to whether the text reflects someone who is from India or from Indonesia, but rather to make the point that if such a large portion of the text is a list of names, this is why the text seems so agrammatical/idiosyncratic to many commenters. If it is just a list of names (perhaps colleagues who have more expertise in Indo-Aryan and/or Bahasa Malay/Bahasa Indonesia can share their insight), then we should focus on the audio recording. It's difficult to transcribe things solely from an audio file, without the opportunity to check pronunciation, but perhaps several of us could try and see what we come up with. I'm very glad to learn that she will be shown a map of South and Southeast Asia and will be very eager to learn her reactions. 6. SHD gave us some clues about her physical appearance, and they would fit comfortably with Burma. Etc., etc. In other words, I think that a place somewhere in Burma / Myanmar is still a prime candidate for her home community. I agree with your approach. To me these monosyllabic words are just unfinished writing of longer polysyllabic words. Some mental disorders like schizophrenia sometimes prevent people from coherent and consistent action, especially the coordination between eyes and hands. So she might have thought of something and written down part of it, and then skip this word for the next. I want to thank you for your smart, new approach to her writing sample. I actually quite agree with you that her writing does not reflect any particular writing system or systems, though it may in places borrow from various established scripts. Many of the symbols she uses may be of her own devising and experimentation, and — as you astutely say — may be an attempt to communicate visually / graphically / diagrammatically. Also, Sapa is a word in Tagalog meaning "stream, brook, creek." Not sure if this is relevant, given the distance from Philippines to Nepal and the general mix of linguistic and non-linguistic (?) elements in her writing, but I figured it was still worth sharing. Another question: Has anyone asked her to write something else? It would be interesting to see if she repeats anything or writes something completely different. Although I still think the most likely point of origin is somewhere around Burma, Eli's suggestion of the Philippines, though distant, is quite interesting: the Sapa Sapa, the sound systems of the languages there, Islam, Christianity, etc., all fit fairly well. SHD tells me that she uses English with his colleagues and, according to them, she is also comfortable with Hindi and Urdu. This is extremely important information. Staff from both the Indian and Pakistan consulates were invited to come and talk with her, but neither claimed her as their own. So it is hoped that rest and treatment outside the Immigration center will help her regain her memory. Since she speaks Hindi and Urdu, but is not admitted by the consular officials of India and Pakistan to be from their countries, I still stick to my old Burma hypothesis, though I've also often thought that she might be from the Darjeeling-Sikkim-Bhutan region, where the Nepali refugee problem is huge. Very interesting that she can speak all of those languages. I am a bit confused. Hindi and Urdu is almost the same language with different scripts. Did the UN staff and Indian/Pakistani consulate people test her recognition of either script? It would be surprised if she could identify words in both scripts easily. Wow, just came to this thread – certainly fascinating. While I am no expert either I have some experience with Bhutanese languages and this certainly sounds like nothing from either the Central or East Bodish language families – they have no standardised writing in general, but what she is using would be a stretch to consider it anything like the Tibetan script used in Bhutan. I also agree that it both looks and sounds a lot like an Austronesian language – the nearest of which I'm guessing is something like Moken of southern Burma. I also looked at Lisu, Lipo and Zomi but i don't have any knowledge or even references to these languages so I don't know. Interestingly, the Lisu syllabary ( http://en.wikipedia.org/wiki/File:Lisu_script.GIF) given on Wikipedia looks like it is derived from Chinese but quite distinct and simple, much like this writing sample. I was hoping that someone would mention Lisu (who dwell in the mountainous regions of Burma / Myanmar, Southwest China, Thailand, and the Indian state of Arunachal Pradesh), because I had a vague recollection that our lady's writing resembled it to a certain degree (I don't know anything about Lipo or Zomi) , and my constant suspicion has been that she hails from somewhere between southern Yunnan and Sikkim-Bhutan, with a Nepalese from the latter area or a hill person from Burma still remaining my strongest suppositions for her. Your link to the Lisu script GIF didn't work for me, so I'm recopying it here (if you copy and past it into your browser, it will work). As for Hindi and Urdu, they are indeed close enough to each other (essentially identical except for the latter having more Arabic and Persian loan words), but are written with different scripts, hence they constitute a true digraphia. The consular officials from India and Pakistan satisfied themselves that she was not from either of their countries. Although she can speak Hindi / Urdu, she apparently cannot write either of them, and that is probably one of the criteria by means of which they rejected her as coming from their countries. Totally absurd reason for these officials. Discrimination towards an illiterate person. Sorry my colleagues and I haven't had time to obtain another writing sample from our lady because of work. Hopefully this weekend I will be able to get something. Could you get a simple vocabulary from her, say, the numbers from one to ten? If you can't record it, write it down to the best of your ability; that would make identifying her language much easier. It is not uncommon for numbers to be loanwords, so words for body parts (hand, arm, eye, ear, heart) or natural objects (sun, moon, stars, etc.) might be more useful. There is news, and it is good. After some very diligent investigation, the lady's place of origin and identity have been determined. The results are somewhat surprising. SHD will be making a summary update before long.